JABER AS-SARHAN, Jordan – Syrian government forces recaptured a vital border crossing with Jordan on Friday and raised the national flag for the first time in years, restoring sovereignty over a key region and potentially reopening a gateway for Syrian exports to Arab countries. It marks the return of President Bashar Assad’s forces to the province where the uprising against him began seven years ago, following successive military victories across most of the country with the help of powerful allies Russia and Iran. It also underscores America’s remarkable declining role and influence in Syria. “What is happening in southern Syria is a big achievement for the Syrian army and its allies and a resounding defeat for America, Israel and their allies,” said an official of the Iranian-backed Hezbollah militia, Ali Daamoush, during a Friday prayers sermon in Beirut. The rebels in southern Syria once received significant backing and support from the U.S. that has receded and all but dried up over the past few years. 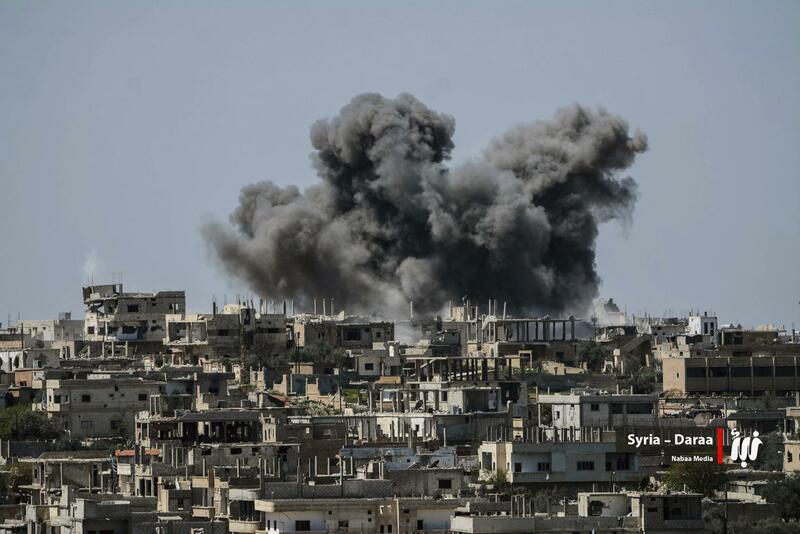 Although the U.S. government negotiated a de-escalation agreement for southern Syria last year, it has remained silent as Assad’s forces marched onto Daraa in the past two weeks in a crushing assault that displaced more than 330,000 people. Similarly, Israel is quietly acknowledging that Assad’s forces will soon be on its doorstep, laying down red lines for postwar relations with the Syrian leader. Israel’s main concern now is to keep archrival Iran as far away from its border as possible – along with its proxy, the Lebanese militia Hezbollah. The government’s offensive to retake Daraa and the nearby Quneitra region on the frontier near the Israeli-occupied Golan Heights began on June 19, and is now expected to turn more forcefully toward retaking Quneitra, potentially setting up a clash with Hezbollah and Iran unless they agree to stay away from the area as Israel demands. An Associated Press journalist on the Jordanian side of the border could see the Syrian side of the crossing, along with the former free zone and some blue tents housing displaced people. The Syrian flag flew in the distance, along with what appeared to be a Russian flag. The rebels seized control of the crossing in 2015, severing a major lifeline for Syrian exports and disrupting a major trade route between Syria and Jordan, Lebanon and the oil-rich Gulf countries. There was no immediate comment from Jordan on the Syrian forces’ recapture of the Naseeb crossing. On Twitter, Jordanian Foreign Minister Ayman Safadi said Amman was holding talks with all parties to the Syrian conflict focused on ensuring the return of the displaced. “The solution is political and the protection of civilians, preventing their displacement and saving the (Syrian) brothers more suffering is everyone’s responsibility,” he wrote. The rebels accused Washington of betraying the opposition fighters after international community bowed to Russian pressure. “We were betrayed mostly by the Americans. We should have been cautious by our friends and the betrayal of friends,” the spokesman for the rebels’ joint operations room, Ibrahim Jabawi, said bitterly. Hezbollah, meanwhile, boasted that some of its elite units were helping to direct battles close to the front with the Israeli-occupied Golan Heights. An official with the Iran-led coalition supporting Assad, known as the axis of resistance, told the AP that the Hezbollah forces were deployed and ready to take part in fighting when needed. The claim could not be independently verified. Hezbollah has sent thousands of fighters to Syria since 2013 to help Assad’s forces, tipping the balance of power in his favor in several areas, including along the border with Lebanon. The group has in the past aired videos of its fighters’ participation but this time they appeared to be taking a lower profile so as not to escalate tensions in a region where any wrong step could lead to a regional war. Jabawi, the rebel spokesman, said that under the Russian-mediated surrender agreement, the insurgents would begin to hand over some of their heavy weapons in return for a government pullout from several southern villages. He added that Russian military police would deploy along the border with Jordan, including at the Naseeb crossing, and that rebels opposed to the deal would be evacuated to rebel-held regions in northern Syria. Friday’s agreement came after the bombardment of rebel-held areas intensified earlier this week after the rebels rejected a deal with the Russians. The crushing new wave of attacks appears to have compelled the rebels to accept the deal. A Syrian man on the Syrian side of the border said he and his family had been camped out near the Jordanian border for 10 days after fleeing the bombardment and airstrikes. The 70-year-old, identifying himself only as Abu Mohammed, said Syrian troops were now heading for the border. “We are stuck here and God only knows what the regime will be doing now,” he said by telephone, with the sounds of children around him. Published: July 6, 2018, 8:39 a.m. Updated: July 6, 2018, 12:19 p.m.